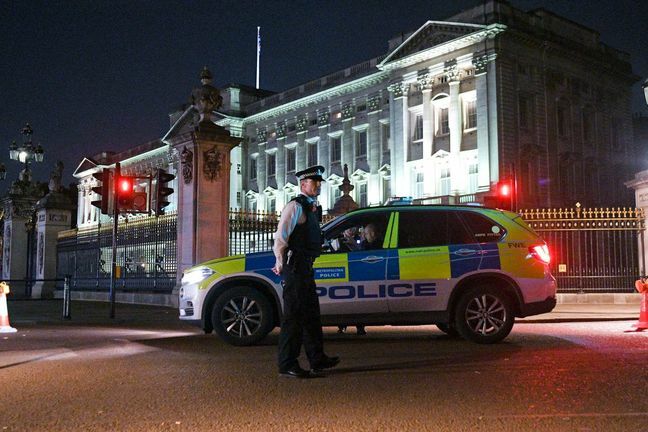 EghtesadOnline: A 26-year-old man used a four-foot sword to slash London police officers near Buckingham Palace in an attack Scotland Yard said is being investigated as a terrorist act. Three officers were hurt in the Friday incident, the Metropolitan Police said in a statement Saturday. The attacker, who drove his car into a restricted area and shouted “Allahu Akbar,” was arrested at the scene for assault and later was charged under the U.K. anti-terrorism law, police said. According to Bloomberg, the Toyota car had stopped in front of a police van near the palace about 8:30 p.m. Friday, police said. When the unarmed officers approached the vehicle, the man grabbed the sword from the passenger’s side of the front seat. He caused minor injuries to the officers before being subdued by type of tear gas known as CS spray, the police said in the statement. Major European cities have been targets this year for terrorists, some using knives. A Somali man in Brussels on Friday night was shot dead after police said he attacked two soldiers with a knife. In Barcelona, two attacks using vehicles a week ago killed 15 civilians and injured scores of others. Terrorists using trucks plowed into passersby on bridges in two deadly incidents this year, including one in which citizens were knifed. There was also an attack using a commercial vehicle in Stockholm. U.K. Prime Minster Theresa May, in two tweets Saturday, thanked the officers for acting “quickly and bravely” to protect the public.